Powerful, easy photo editing software with a complete set of image manipulation tools. It allows you to enhance your photos, add beautiful effects, decorate images with artistic borders and frames, create greeting cards and collages! Home Photo Studio is a powerful, fun and easy photo editing program offering a complete set of image manipulation tools. Thanks to a convenient interface and a detailed help system, the software is simple to learn but provides enough options to keep any photo enthusiast creatively occupied. With Home Photo Studio, you can view and edit your digital shots. Photos can be retouched, color can be enhanced, red eye can be removed, and blurred images can be made clearer. All of these changes can be made with a click of the mouse! You can add special effects to your photos, including lighting, weather effects, and even 3D composition - a feature not commonly found on non-professional photo editing programs. Frames in a wide range of styles can be added to the photos, as well. When the photos have been enhanced, they can be used to create slide shows, postcards, and collages, which can be shared with others. This photo editing software includes hundreds of special effects, design templates, and project options that can be used with digital photos on computers. If mistakes are made during the editing or enhancing process, the multi-undo feature makes correcting the error easier. 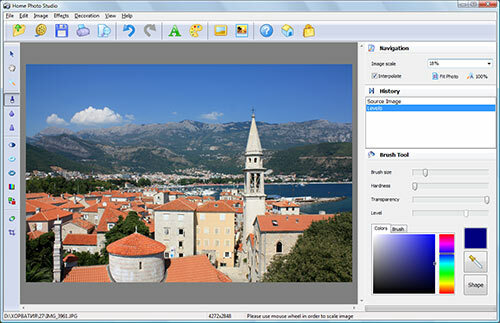 Additional features found in the software include the ability to quickly view EXIF data and to use plastic effects on photos. Users will appreciate the detailed help system built into the program so they can find answers when having trouble with a new project. Home Photo Studio provides all of the features and extras needed to modify and enhance digital images. 2012-05-23 3.25 New version of easy photo editing software adds pseudo HDR and 3D reflection effects. Now it supports English, French, Spanish and Italian languages.